A document created by Sarah Thorncroft as part of the Oviedo History Harvest in 2015. 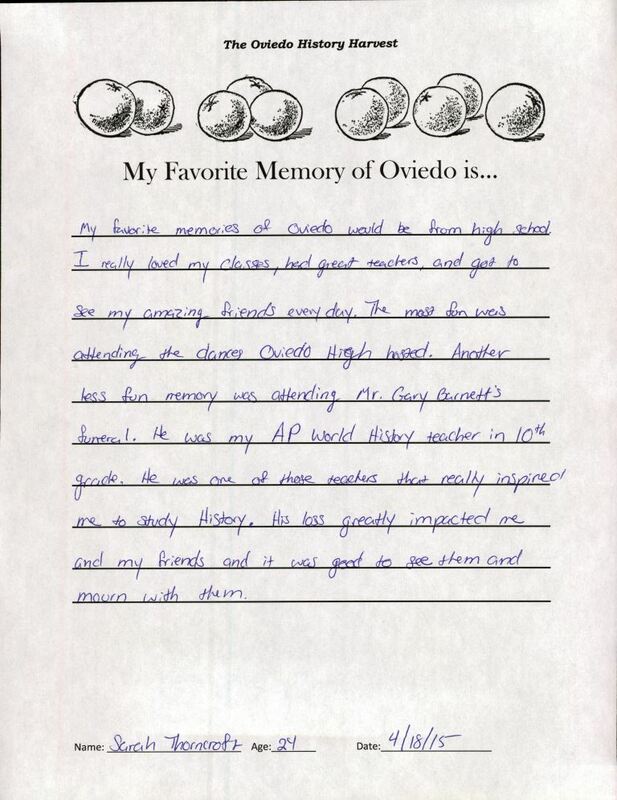 In the document, the author is asked to describe her favorite memory of Oviedo, Florida. Thorncroft, who was 24 at the time, stated that attending Oviedo High School and attending the funeral of a teacher, Gary Barnett, were her favorite memories. Original document by Sarah Thorncroft, April 18, 2015: Oviedo Historical Society, Oviedo, Florida. Digital reproduction of original document by Sarah Thorncroft, April 18, 2015. Originally created by Sarah Thorncroft and owned by Desta Horner. Thorncroft, Sarah. 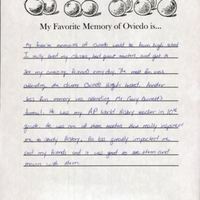 “"My Favorite Memory of Oviedo Is..." by Sarah Thorncroft.” RICHES of Central Florida accessed April 25, 2019, https://richesmi.cah.ucf.edu/omeka/items/show/6343.